E-cigarettes have been surging in popularity, and a new government study suggests this effect is trickling down to U.S. teens. New findings from a national survey on youth tobacco use showed that the percentage of middle and high school students using electronic cigarettes doubled from 2011 to 2012. Researchers from the Centers for Disease Control and Prevention examined data from the National Youth Tobacco Survey, which polls about 20,000 adolescents in grades six through 12 on their tobacco-related beliefs and attitudes, use habits and exposure to pro- and anti-tobacco influences. They found e-cigarette use increased from 4.7 percent of surveyed high school students in 2011 to 10 percent by 2012, the last year data was collected. E-cigarette use increased from 1.4 percent of middle school students in 2011 to 2.7 percent last year. That worries health officials, because 90 percent of all smokers start when they're teenagers, according to hte CDC. "The increased use of e-cigarettes by teens is deeply troubling," said CDC Director Dr. Tom Frieden, adding nicotine is a highly addictive drug. "Many teens who start with e-cigarettes may be condemned to struggling with a lifelong addiction to nicotine and conventional cigarettes." The increases appear to follow a trend seen in adults. A Feb. CDC study found more than a doubling of e-cigarette use among adults, finding 21 percent had used the devices in 2011, up from 10 percent in 2010. E-cigarettes are battery-powered devices that provide users with a vapor filled with nicotine and other additives, like flavoring or components to produce the aerosol. Some products tested have contained potentially harmful substances, like irritants and animal carcinogens, the CDC authors pointed out. Without regulation by the Food and Drug Administration -- the FDA only regulates e-cigs that claim therapeutic benefits, like smoking cessation -- e-cigarettes can be sold to minors in states that don't restrict the sales, the authors added. Electronic cigarettes containing nicotine are not subject to the same federal age restrictions as other nicotine-containing products like cigarettes, cigarette tobacco, roll-your-own tobacco and smokeless tobacco, according to the FDA. One study finding that concerned the CDC was that one in five middle schoolers used e-cigarettes without ever using a tobacco product. "These dramatic increases suggest that developing strategies to prevent marketing, sales, and use of e-cigarettes among youth is critical," Dr. Tim McAfee, director of the CDC's Office on Smoking and Health, added in a statement. The new e-cigarette findings don't suggest kids are skipping tobacco entirely. More than 76 percent of middle and high school students who used e-cigarettes within the past 30 days also smoked an actual cigarette during that time. Smoking tobacco can increase risk for some cancers, heart disease, stroke, and respiratory problems. However, health effects from e-cigarettes, and whether or not they raise risk for people to start using tobacco, have been unclear. Some European countries have recently taken actions against e-cigarettes due to uncertainty over health effects. 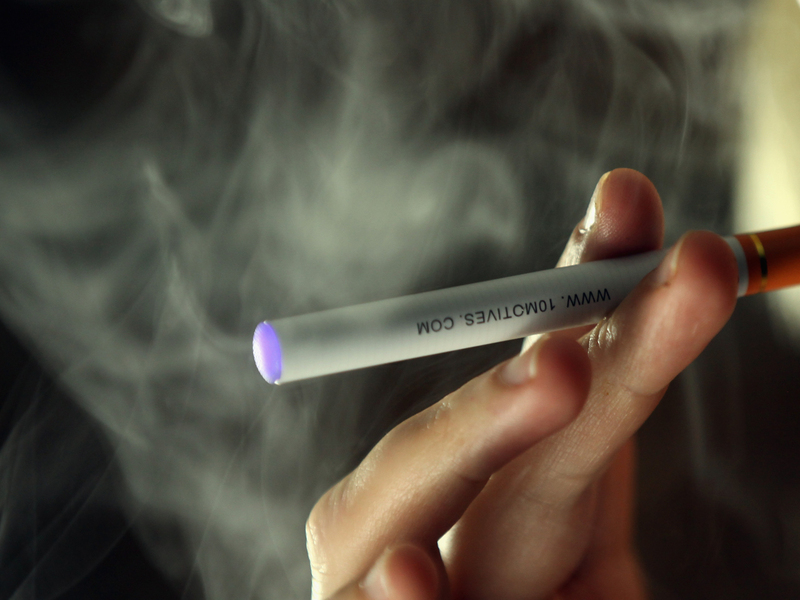 France decided in May to extend its public smoking ban to include e-cigarettes. "This is no ordinary product because it encourages mimicking and could promote taking up smoking," France's Health Minister Marisol Touraine, said at the time. Weeks later, the Medicines and Health Regulatory Agency (MHRA) in the U.K. -- an agency similar to the FDA -- said it would regulate e-cigarettes like medicines, a move to ensure the products are safe and more effective in reducing the harms of smoking. The FDA has announced it intends to expand its jurisdiction over tobacco products to include e-cigarettes. The study "is cause for great concern as we don't yet understand the long-term effects of these novel tobacco products," Mitch Zeller, director of FDA's Center for Tobacco Products, said in a statement. "These findings reinforce why the FDA intends to expand its authority over all tobacco products and establish a comprehensive and appropriate regulatory framework to reduce disease and death from tobacco use." The CDC's new study was published Sept. 5 in Morbidity and Mortality Weekly Report. Tune into the CBS Evening News tonight at 6:30 p.m. ET to find out more on the report.